Mofongo Puerto Rican Style Plantains are a paleo friendly , delicious, sub for mashed potatoes. Made with mashed plantains, garlic and bacon, you may even like it better than potatoes! While visiting the beautiful Island of Puerto Rico last summer, I became obsessed with their delicious Mofongo. I must have ate at least 5 different kinds. I learned to make it, but had to change it a little to make it more Paleo friendly. It can be made as a side dish, or topped with marinated beef, chicken, or shrimp as a main-dish. 3 Coves Garlic Peeled and Chopped. 1/2 Lb to 1 Marinated and cooked Beef, Chicken or Shrimp ( I marinate mine in a sauce of : 2 tbsp olive oil, 2 cloves minced garlic, 3 tbsp cilantro, 2 tbsp lime juice and 1 tbsp vinegar, then bake for 20 or more minutes in 400 F oven.) * optional, omit if making this a side dish. Put on some rubber gloves, really do it, plantains stain your skin and nails black. Score ,with sharp knife, the plantains down each rib, about four lines. Wedge your fingers or a spoon between plantain and the peel ,then slide down until each scored section of the peel comes off. * might take a little practice. Chop Plantains into small slices, and add to a stock pot. Pour chicken broth over plantains in pot. Add 3 cloves chopped Garlic to broth, and bring pot to a boil. turn heat down to medium, cover pot and boil for 25 to 30 minutes, or until plantains are really soft. while Plantains are cooking, Fry Bacon slices till crisp. Remove bacon from pan and set on paper towels. Add 4 cloves of minced Garlic to bacon grease in pan, and saute until softened. Add: bacon, garlic with a little bacon grease, chopped cilantro, and olive oil to a food processor. Process until a paste forms, remove paste and put in a bowl, and set aside. Drain cooked plantains in a colander. Place plantains back in the warm pot and mash with a potato masher or electric hand beater. Mash or beat until it forms a "lumpy mash potato" consistency. Add the bacon cilantro paste to your mashed plantains, and stir in well. Separate mashed plantains into 4 lumps. Mold each lump on a plate with your clean hands, (sorry, o.c.d moment). Put marinated meat over top for main dish, or leave plain for a side dish. Just made it w coconut oil and clarified butter! Still yum. Thanks for creating this! Jenny, Thanks for trying the recipe. You can’t go wrong with clarified butter!! Laura, I know it is not traditional Mofongo by any means as I did not use tostones to make them. I have made them that way before, but was trying out a simpler way to make plantains. The Monfongo I had in Fajardo, Puerto Rico was the best I’ve ever had. 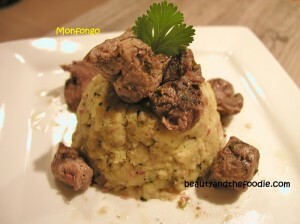 We loved the mofongo we had in Puerto Rico and wanted make it here at home. The gloves and preparation seemed a bit much, so I tried a more unconventional approach. I roasted the plantains in foil on the grill, along side my grilled chicken. The peels pop open when the plantains are done and it was so easy to remove the plantain and mash it up with the cilantro, garlic, and cooked bacon. Yum. The second time I took it out of the foil and fried it a bit in the bacon pan. Hi cindy, that sounds much easier. Peeling them, is the part I dislike the most. Will have to try the grilling method. Thanks for the tip. Is there a good way to reheat this? It can be reheated, but does tend to get a little dry when reheated. I would add some broth to it, while reheating to counteract any dryness. Hello, I am puertorrican and also make it frying the plantains and with “chicharron”. Now, this sounds really good and healthier. I am making it today. I am pretty sure this recipe is very close to how they make it in Dominican Republic and they call it Mangu. 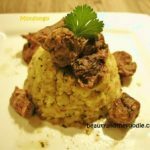 Thank you for sharing this Paleo Mofongo. Hi Maria, I love Puerto Rico and all their amazing food. I have never been to the Dominican Republic. But,I would love to go there and try Mangu. I hope you like this version almost as much as the traditional one. Thanks for trying it. The traditional mofongo recipe calls for making tostones, then mashing them. Justboiling the plantains would probably produce a texture much softer than true mofongo. Hi TJ, You are correct. I have made mofongo the traditional way in PR. I was trying to make them in a “somewhat” healthier, and faster way. It is much softer than authentic Mofongo. The traditional kind usually has chicharrones instead of bacon also. I do love it made with tostones, however. back again for a lot more browsing and commenting shortly.